Few things in this world are more unpredictable than 20-year-olds under a serious amount of pressure. Welcome to the 2018 NCAA Championship. As a former collegiate golfer myself, the NCAA Championship is one of my favorite events of the year. Playing as a part of a team and knowing your score is a part of something bigger is a unique experience for a golfer. The chance to win a national championship with your guys is the opportunity of a lifetime. This week, 30 teams will take on Karsten Creek with a chance to become a part of history. Just outside of Stillwater, Oklahoma, Karsten Creek is the home golf course of the Oklahoma State Cowboys. The course winds through tight corridors and requires your full attention to score well. Assuming the weather cooperates, it will be firm, fast, and demanding. Every team will play three rounds of stroke play before being cut to the top 15 teams for a fourth round. Crowning the individual champion comes after the 72 holes and the top 8 teams will move on to match play to determine the team champion. The teams who advance to the finals will play 6 consecutive days of high-stakes golf in the Oklahoma heat. Like every sport, some teams have better chances at winning the title than others. The powerhouses can separate themselves in stroke play but match play is the great equalizer in this tournament. A full team effort is required in match play and one bad day will end your season. 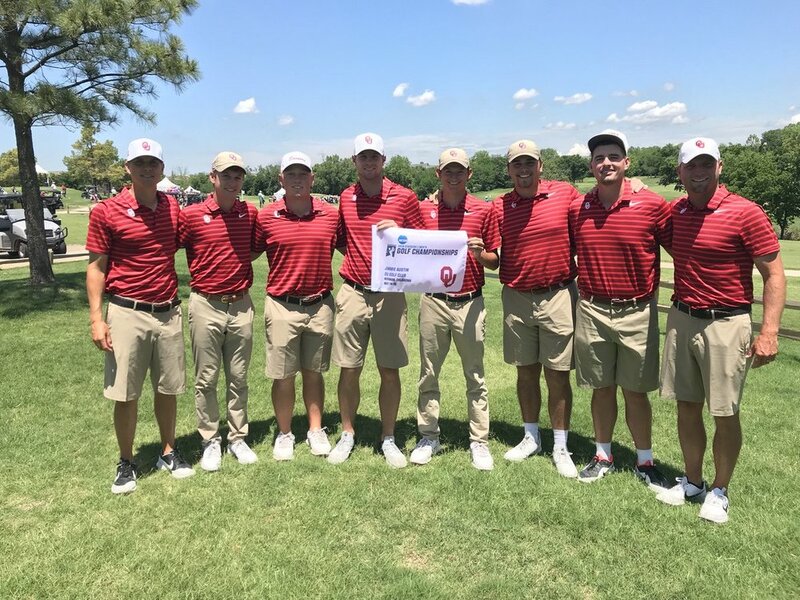 This is the 10th season of match play in the NCAA tournament and to this point only the 2014 Alabama team has won the national title as the #1 ranked team in the country. With that in mind, we could see any number of teams win the title...but that is no way to write a preview article. Here are the 13 teams I will be watching most closely this week. I don’t have a good reason for picking 13, I just did. Four are long shots, five are teams destined to make some noise, and four are powerhouse favorites. Bon Appétit. Arkansas - The Razorbacks have shown some sparks at times, but their inconsistency scares me. For example, they went from 2nd to 10th to 4th at the Norman Regional to qualify for the NCAAs. When they put together strong tournaments, they can compete with anyone. They are ranked in the top 20 in the country after all. Still, if they show up flat this week, they could fall behind early and go home quickly. Kent State - Coach Herb Page is one of the most respected coaches in the NCAA for what he has done at Kent State. This mid-major school is consistently in the NCAA conversation, and Coach Page always recruits great talent. They showed that they could compete with anyone with their 2nd place finish at the Aggie Invitational and I would love to see them get hot this week. They would be a cool story to follow if they make it to match play. North Florida - The Ospreys! UNF honestly played pretty poorly this year until the end of March but has been on a tear since that point. Coming out of the Atlantic Sun Conference, they don’t line up great against the top teams in the country. It is because of how big of underdogs they are that I like their chances. They have shown that they can gel and play some great golf this spring, let’s see if they can do it in Stillwater. Alabama - There is little doubt that Alabama is one of the best teams in the country. Davis Riley and Lee Hodges are the real deal. Jonathan Hardee and Davis Shore have put together solid years as well. Still, the Crimson Tide have been unable to put together whole tournaments this spring. In the NCAA format, this means that they will probably be good enough to get to match play and then anything can happen. Coach Jay Seawell will have the team ready so don’t be surprised if Alabama wins its 3rd title this decade. Florida - I love Florida’s team. They are incredibly balanced top to bottom and their win at UNLV's tournament showed they can beat the best teams in the country. The only hesitation I have with them is that they stalled a little bit this spring. It’s not that they were playing poorly, but they were not playing to their full potential. All in all, they are still a fantastic squad. Andy Zhang played in the US Open at 14 years old (Olympic Club) and is now helping to lead the Gators as a sophomore. Chris Nido, John Axelson, and Alejandro Tosti have been great as well. The Gators would be a match play opponent I would not want to face. Illinois - This will be Illinois’ 11th straight NCAA appearance. Coach Mike Small completely turned this program around, making them a perennial powerhouse. The fall semester was tough for Illinois as they tried to find a consistent roster behind Dylan Meyer and Nick Hardy. The spring has been very impressive for the Illini who have amassed three wins and two runner-ups in their last five starts. Brian Baumgarten and Michael Feagles have found their stride alongside Hardy and Meyer and seem to be ready for the NCAAs. I still question their consistency, but they do match up very well with the top teams in the country for match play. Auburn - I don’t think there is a hotter team than Auburn right now. In the spring semester alone, the Tigers have three regular season wins, a runner-up, an SEC Championship over rival Alabama, and haven’t finished worse than 6th. I would be shocked if they don’t make it to the match play portion but I still am unwilling to bet on them to win the whole thing. The strongest fields that they played this year gave them trouble, and the NCAA field is...pretty good. Vanderbilt - Up until this very second, 9:41 PM on May 22nd, I had Vanderbilt in my favorites category. They are a deep team that is well suited for match play. While I still think they will get there, I worry that they are going to run into Oklahoma or Oklahoma State early in the bracket. They have been my favorite to win the NCAA title all spring but have disappointed me with their lack of dominance in recent events. At their best, I think Vanderbilt is the best team in the country. Will they perform at that level this week? I don’t know...I hope so. In no particular order, these are the four teams I think have the best chance to win the NCAA title. Texas A&M - In their 11 stroke play events this season, A&M finished in the top 3 ten times, including six wins. That essentially puts them in match play before the first tee goes in the ground at Karsten Creek. Chandler Phillips is a top 10 player in the country. Dan Erickson, Walker Lee, and Brandon Smith are all freakin’ awesome as well. Imagine if they still had Cameron Champ? Yikes. The Aggies are going to be put in a primetime matchup, and we will see how they do under the bright lights. They are the 2nd ranked team in the country and are trying to prove that they are #1. Oklahoma - I have a Ben Crenshaw feeling about Oklahoma. After winning the national title last season, they got off to a relatively pedestrian start in the fall and early spring. In their previous five starts, they have four wins and a third-place finish. All five of their players have an insane amount of talent. They can all shoot 66 in the stroke play portion. They have match play experience. It all seems to line up. Alabama and Augusta St. have gone back-to-back in the match play era, I think Oklahoma can join them. Texas - In early February I wrote, “Texas is going to get better; I would bet the farm on it. Doug Ghim is the real deal and can lead this team to great things”. They didn’t exactly light the world on fire, but they did win the Raleigh regional and tied for second at the Big 12s. Doug Ghim has proven himself as one of the best players in the NCAA and Scottie Scheffler has remembered that he is fantastic at golf. Add in a couple of role players and bam; you have a championship caliber team. 2009 Oklahoma State: Rickie Fowler, Morgan Hoffman, Kevin Tway, and Peter Uihlein. 2013 California: Brandon Hagy, Max Homa, and Michael Kim. 2016 Texas: Beau Hossler, Gavin Hall, Doug Ghim, Scottie Scheffler, and Taylor Funk. The best team on paper does not always win. As I said at the beginning, 18-22-year-olds don’t always deal with pressure in the best way. It is NCAA Championship week, let’s have some fun.